With article after article these days pontificating on the value of Social Media Marketing to businesses small and large, we’re happy to finally be able to present a study from a reputable media tracking company to provide findings based upon the analysis of survey data using standard research methodology. Read the study summary below to learn Nielsen’s findings. A recent joint study from Nielsen and Facebook, titled “Advertising Effectiveness: Understanding the Value of a Social Media Impression,” analyzed survey data from more than 800,000 Facebook users with regard to more than 125 Facebook ad campaigns from 70 brand advertisers. The report provides quantifiable data that can be mapped to trusted advertising benchmarks: Ad Recall, Brand Awareness, and Purchase Intent. Studies have shown that consumers trust their friends and peers more than anyone else in making a purchase decision. The authors acknowledge that it’s critical to understand advertising not just in terms of “paid” media, but also in terms of how “earned” media (passed along or shared among friends) and social advocacy contribute to campaigns. For those Homepage engagement ads at the top of the marketing funnel, awareness increased on average by 4% between exposed and control audiences. Purchase intent also increased on average by 2% following ad exposure on Facebook. Comparing the responses of those users who had seen ads with social context against users who saw ads with no social context from the same campaign, there is a measurable lift in lift. While exposure to the homepage ad itself increased ad recall, those users exposed to both the “paid ad” and the organic impression remembered the ad at three times the rate of those just exposed to the paid homepage ad. We saw a similar effect for the other two metrics evaluated. Homepage ads increased awareness of the product or brand by 4% on average, but exposure to both homepage ads and organic ads increased awareness by a delta of 13% versus the control group. Exposure to organic impressions also impacted purchase intent as well, increasing the impact of the ad from 2% to 8%. To access additional visuals in the TopLine report, please visit Nielsen here, or for the complete PDF file on earned media, social advertising and the methodology behind the study, please visit here. If you would like to learn more about Mobile Marketing and how it can help your business increase revenue, please TEXT the word STRATEGIC to 244326. This will opt you in to Strategic’s Mobile Club, and notify us to schedule you for a FREE demonstration. Members of our Mobile Club will be eligible for future special offers, and will receive tips on using Mobile Marketing to benefit your business as well as other useful info to help grow your business. 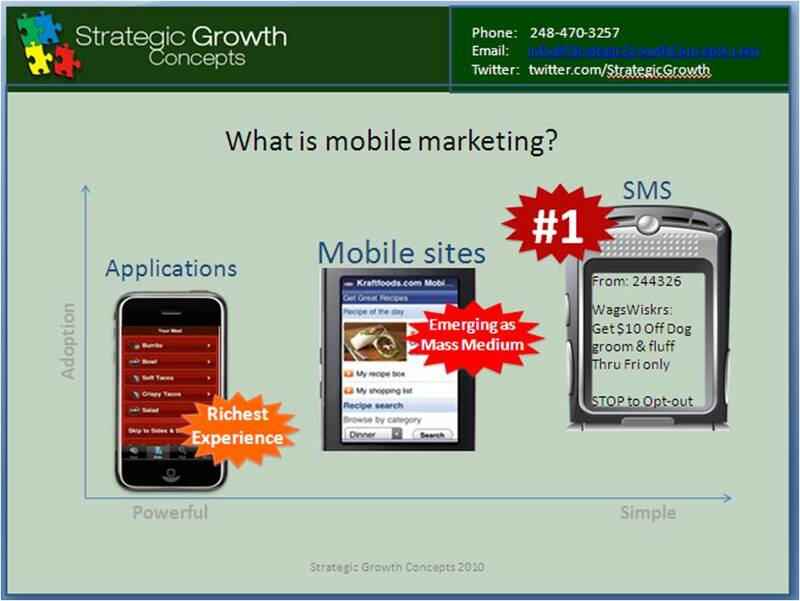 If you prefer not to join the Mobile Club but would still like to receive the FREE demonstration, you can contact us directly at info@StrategicGrowthConcepts.com. Mobile Marketing Can Now Be Easy – Even for the Smallest Businesses! Small business owners can now implement their own unlimited mobile advertising campaigns – within minutes – for as little as $25 per month, through a service now being offered by Strategic Growth Concepts. 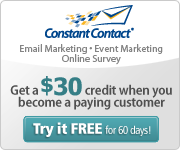 Mobile marketing is now easy to use - for even the smallest businesses! As part of our continuing effort to provide our clients with the latest technologies available to enable their marketing efforts, Strategic Growth Concepts has become a Certified Mobile Solutions Provider with a national text marketing solution. Strategic Growth Concepts CEO states, “We believe strongly that it is our mission to help small businesses help themselves when it comes to promoting their businesses. Through our work with small businesses over many years, we understand that Marketing is sometimes intimidating to small business owners with little experience in this area. Therefore, Strategic constantly seeks to add marketing vendor services to our arsenal that are easy for small business owners to learn and implement, as well as being cost-effective. We are very conscious of the limited budget and time resources held by most small businesses.” She further adds, “We are confident that small businesses that elect to utilize our text messaging vendor will be extremely happy with the results and added revenue that they achieve!”. We’re very happy to make this service available to small businesses so they can now take control of their marketing and get large results with a small monthly investment and very little time. And, no contracts required! Until April 15th, Strategic is offering a 50% discount to businesses that sign up to utilize our text messaging services. To obtain a FREE mobile marketing demonstration and learn how your firm can receive a 50% discount on getting started, please read our complete news release.